THE pretty ceramic bird whistles at the Lokotsav this year are as pretty as ever and most everybody is tempted to buy a single piece or a couple of them. Dip a bird whistle in water and whistle away! The whistling makes everyone around look up to find out where the whistling is coming from. These bird whistles have become very popular and the price has risen steadily from `10 to the current `50 per whistle. Ramlal from Alwar, Rajasthan, says this year the ceramic bird whistles are `50, tortoises `40 and the flaming flowers of foam `70 or so, please bargain if you wish! All three items make for a pretty decorative arrangement around a water pool. Here are also the familiar ceramics from Khurja at the entrance of Lokotsav and Goans and tourists alike spend time looking and picking up mugs, cups and saucers, teapots, a set of bowls, vases, plates, indigo coloured soap holders and a large variety of other ceramic beauties. Here too the prices are up, do handle with care. 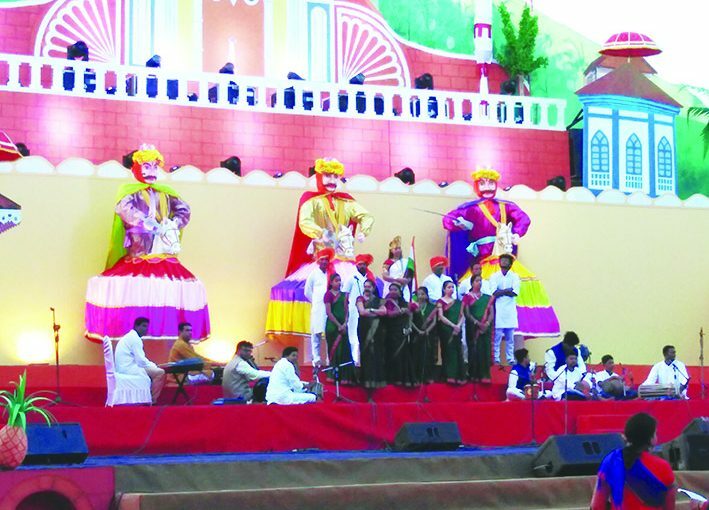 The Lokotsav is in its 20th year and it is undoubtedly Goa’s favourite folk fair or mela organized by the Directorate of Art & Culture in collaboration with the other relevant state departments. Lokotsav has become an extravaganza offering a veritable feast of all kinds of fascinating quality products along with lots of sundry miscellaneous items for home use or décor, also personal adornment and consumption. You may fall for some over and over again and some of them you just pass by without even sparing a look. It’s like there’s a mind-boggling amount of garments for women, men and children, from pristine babywear to wraparound skirts, to dresses, blouses, kurta leggings, all kinds of fancy modern day couture; not to forget the sarees from up north or down south and a wide range of handloom fabrics and household linen, also crochet work. 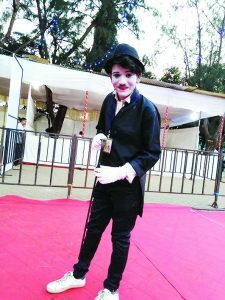 There’s much to appeal to the eye and soul out at this year’s Lokotsav. Next there’s the dazzling attractive and popular ethnic jewellery jostling with eye-catching junk jewellery. So much jewellery. There are also several 1-gram gold traditional jewellery stalls which lure women of all ages and one notices Rajasthani jumka earrings have acquired a colourful silken transformation lately…look at the white metal or so called German silver jewellery which is everywhere and the tribal Aruna and her smart daughter from Telangana confide, “Why does everyone want to bargain and bring price down from `100 to `25!” They assure me their jewellery won’t blacken but it has a natural silvery black sheen. 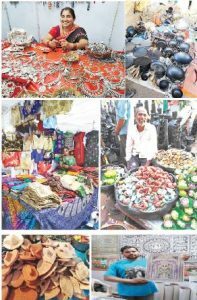 Actually, they are part of some 20 stalls associated with the government’s Tribes (of) India program to boost tribal craftwork and they’re from Nagaland, Rajasthan, Manipur, Udaipur, Karnataka, Andhra Pradesh and other states. These Tribes India stalls have some of the most exquisitely beautiful things! Take a look at the stuff from Himachal Pradesh where a Rajendra Bi tells me Tribes India has its headquarters in Bangalore and their goods are all at government fixed prices. At one of the Tribes India stalls find a genuine collection of pattachitra (or madhubani) paintings from Orissa — these are hand paintings on cloth, tasser silk and tadgola palm leaves. Patachitra is as traditional as you can get with a traditional art form and it is much raved about and in demand by discerning art lovers. An Amar Singh Prajapati here shows off a `4,500 patachitra painting of Tirupati Balaji on cloth and says, “My entire joint family of 36 members is engaged in this artwork in our heritage village called Raghurajpur in Orissa.” There are smaller buys too like the strip bookmarks at `30, one feels like buying all of them and distributing them to friends, better than greeting cards! Pradesh, Warli paintings and more. The lanes are many and mercifully all the foodie stalls are placed altogether in a separate batch of lanes and here one may shop for various masala and condiments, the Goan repertoire of snacks; at one end one may feast on Rajasthani dahivada, jumbo jalebi, gulabjamun…also discover food from the northeastern states, Gujarat, there is also Kolhapuri cuisine. The more you walk the more there is to discover down or up a lane or around a corner. A friend tells me there’s a guy selling pineapple, chikoo, watermelon fruit chips…and thinking this I have to see, but for the life of me I can’t find the man tucked away somewhere in the melee of stalls. There are pickles, papads, vadi, all kinds of masala to make an urban housewife’s dream come true and even eateries now invest in them for nobody is cooking from rock bottom scratch anymore. I usually look for a good tea masala and find it at Stall No.453 where Mamta Marathe and her brother-in-law Shridar Ogale have their Ogale top notch quality of condiments — their mango pulp and tender coconut sachets (coconut powder melts in a glass of water) are bestsellers. Almost everyone buys fresh banana wafers, some digestive “chooran” stuff from Gujarat/Rajasthan, there is a lot of Rajasthan and Gujarat farsan. 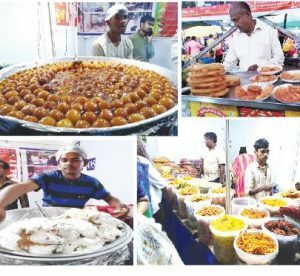 Darya Sangam square at the Kala Academy where the entertainment takes place you may not miss the Panchamrit rice from Hubli… `120 kg Basmati rice, long grain Basmati (`100 kg), jeera rice deluxe, raw lachakar kolam, sona masuri. Five kg Basmati bag – `450. There is also chili powder, corn flour, jaggery here. Honestly, one may go to the Lokotsav every day while it is in town to discover something or another. If you’re Indian at heart you may rejoice in re-discovering the best in Bharatdesh anew, an experience not to be missed. Last day at Lokotsav is Jan 20. Previous post: The story of Makara Sankranti….